2 a.m.: I wake up (or rather, am woken up by thirsty 6-year-old) and go downstairs to get a glass of water. 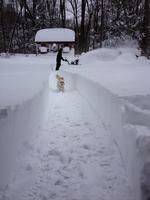 When we went to bed, the snow was about 8-inches deep. Now, we have this. 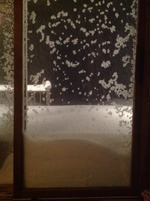 And it’s still dumping buckets of snow. Hmm. I go back to bed and try not to panic. 4 a.m.: Yup, still snowing. 7:30 a.m.: This should make letting the dog out interesting. 7:43 a.m.: The children emerge from their bedrooms. Six-year-old gasps at the snow piled up against the door. “It’s half of me!” Nine-year-old appears whipped into a blizzard frenzy. News and Facebook reports pin the snowfall level to somewhere between 23 to 30 inches. 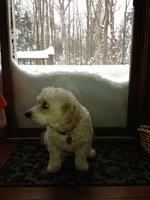 We make first attempt to let the dog out, by opening the garage door and trying to coax him up over the mound of snow. Dog looks at snow, looks at us, goes back inside. Smart puppy.